Why do angels always have to say “Fear not”? When I come up to someone to talk to them, I don’t start out by saying “Fear not,” so why should an angel? Angels are nice, aren’t they? After all, in the movies, angels are always friendly and kind and want to help you. So why do angels in the Bible always start out with “Do not be afraid?” They did have to say that because verse 29 says that Mary was greatly troubled, and in the next chapter, it says the shepherds were terrified by the angels. (I like how the old King James Version put it. It says the disciples were ‘sore afraid’— so afraid that it hurt.) But why? 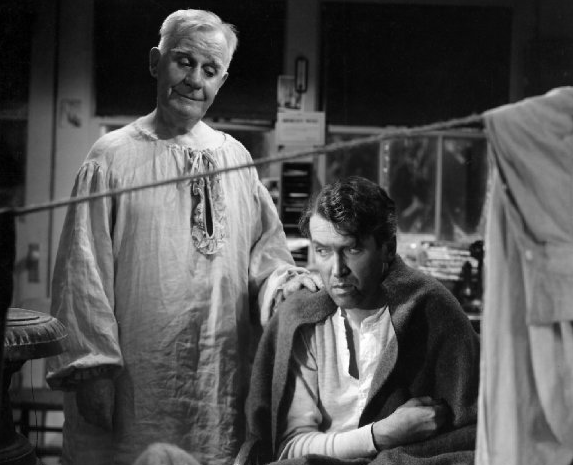 Clarence Oddbody, the guardian angel second class in the 1946 movie classic It’s a Wonderful Life, didn’t look scary at all. He was a cheerful, funny angel, and he didn’t say to “Fear not” when he appeared to Jimmy Stewart. So why all the fear in the Bible? Well, Mary and Joseph and the shepherds were too poor to go to movies, so they just had to rely on what the Bible itself said about angels—and there we find a somewhat different picture. They did not yet have the New Testament, but they did have all of what we now call the Old Testament, and there, angels brought the wrath and punishment of God just as often as they brought the love of God. It was an angel with a flaming sword that stood at the entrance to the Garden of Eden after Adam and Eve were cast out to make sure no one would ever get back in. It was an angel of death what passed through Egypt in the tenth plague, taking the life of the first born in every family. And, it was an angel that swept through the camp of King Sennacherib just as he was about to invade Jerusalem, killing all 185,000 soldiers. In the Old Testament, you did not want to be ‘Touched by An Angel,’ like in that old television series, because that usually meant ending up dead. And that did not happen only in the Old Testament. Acts chapter 12:23 says: “Immediately, because Herod did not give praise to God, an angel of the Lord struck him down, and he was eaten by worms and died.” That’s what can happen when you get ‘touched by an angel’ in the Bible. So maybe Mary and Joseph and the shepherds had a good reason to be terrified at the sight of an angel, and the angels had a good reason to begin their visits by saying, “Do not be afraid; because I am bringing you good news of a great joy that will be for all people.” Do not be afraid. I am not here to kill you, but to tell you some good news. What is that good news? Well, it had to do with birth, not death. In Luke 1:30-31 the angel said to Mary, “You have found favor with God, and you will be with child and give birth to a son, and you are to call him Jesus.” And to the shepherds in chapter two the angel says, “Today, in the city of David, a Savior has been born to you; He is Christ the Lord; and this will be a sign to you. You will find the baby wrapped in swaddling clothes and lying in a manger.” A baby, said the angel. This story is so familiar that we might miss the main point. But think about it, the story of Christmas is the story of God coming to earth, which He created and rules, and He comes as a baby. Of all the ways God could appear to us, who would have expected he would come as a baby? In the Old Testament, God makes his appearances in ways we might expect—in earthquakes, whirlwinds, clouds of fire, burning bushes that do not burn up, bolts of fire coming out of heaven to ignite Elijah’s water soaked altar, and so forth. God appears with unmistakable power and overwhelming strength—just as one might expect. No surprises there. So what does it mean that here, in this story, in God’s most important appearance in all human history, that he comes as a baby? The message of the angels to the shepherds on that very first Christmas Eve spoke of peace. Now while a baby is not always quiet, a baby is certainly not threatening. Therefore, at least a part of the meaning of God’s coming to earth as a baby has to do with this absence of threat or violence in the story. “How silently, how silently, the wondrous gift is given” we sing. Silent. Peaceful. Non-threatening. Think about holding an infant in your arms. They are so small and vulnerable and helpless. It makes some people (including me) nervous to even hold a baby because they are afraid of hurting them. We want to be very careful. But we know that a baby cannot hurt us.